Delhi sultanate was an Islamic kingdom based mostly in Delhi; which was spread over part of the Indian subcontinent for almost 320 years. Five dynasties had ruled Delhi sequentially; Mamluk dynasty, Khalji dynasty, Tughluq dynasty, Sayyid dynasty and Lodi dynasty. Muhammad Bin Farid was the third ruler of the Sayyid dynasty who ruled Dehli Sultanate from 1434 to 1445 AD. The Sayyids were subservient to Timur’s successor, Shah Rukh. 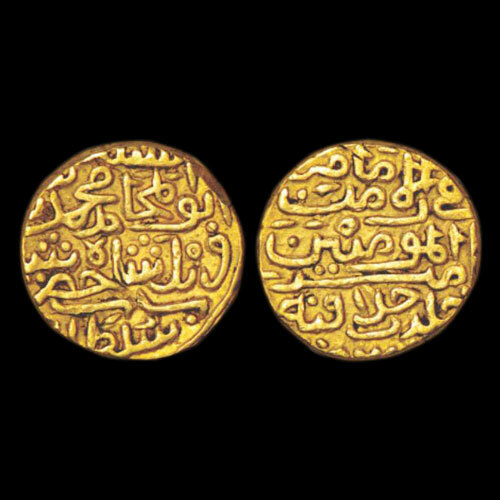 This gold Tanka of Muhammad Bin Farid which weighs around 11.13g was sold for INR 65,000 by Classical Numismatic Gallery. The obverse of a coin depicts with Persian legend ‘al Sultan al-a'zam abu l Muhamid Muhammad Shah bin Farid Shah Hadrat Shah al Sultan’. The reverse of a coin inscribe with ‘Fi Zaman al -imam amir al-mu-minin Khulidat Khilafatuhu’.